I was recently in Birmingham again for a few days. We had previously been to the Warehouse Cafe, a vegetarian and vegan cafe, (see my review here) but I wanted to try some different places to eat. The first place we went to was The British Oak in Stirchley near Selly Oak. It is a cosy, traditional English pub that sells traditional pub food. The amazing thing about it is that not only does it have a vegan main meal section on its menu, but it has vegan dessert and drink sections too! 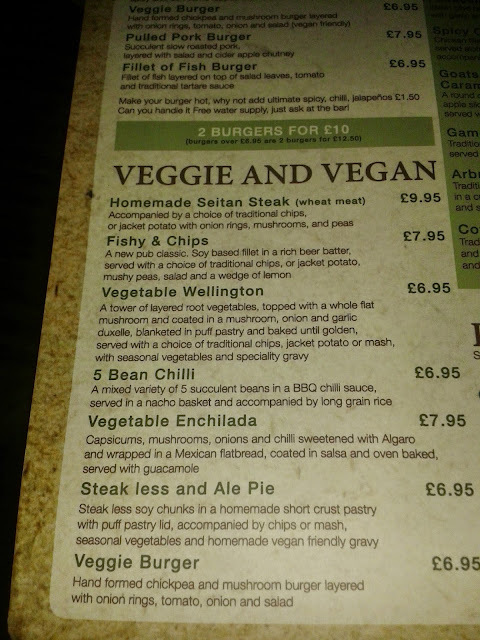 Each section has a varied choice of options, but even before I went I knew I wanted the vegan 'fishy' and chips after seeing it all over Instagram. 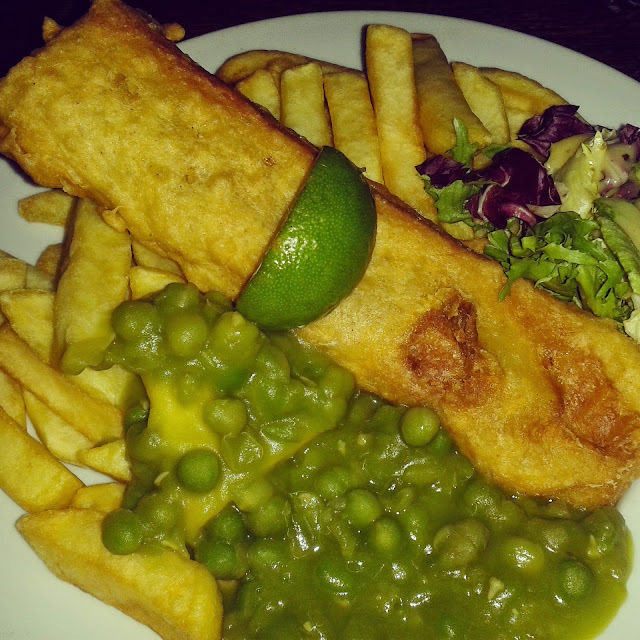 The 'fishy' is a huge piece of tofu encased in beer batter served with chips and mushy peas. The fishy flavour comes from the seaweed that is wrapped around the tofu. It may seem strange to want to recreate the taste of fish but fish get their flavour from the sea, just like seaweed does! It was so delicious and I would highly recommend trying it if you are ever in the Birmingham area. 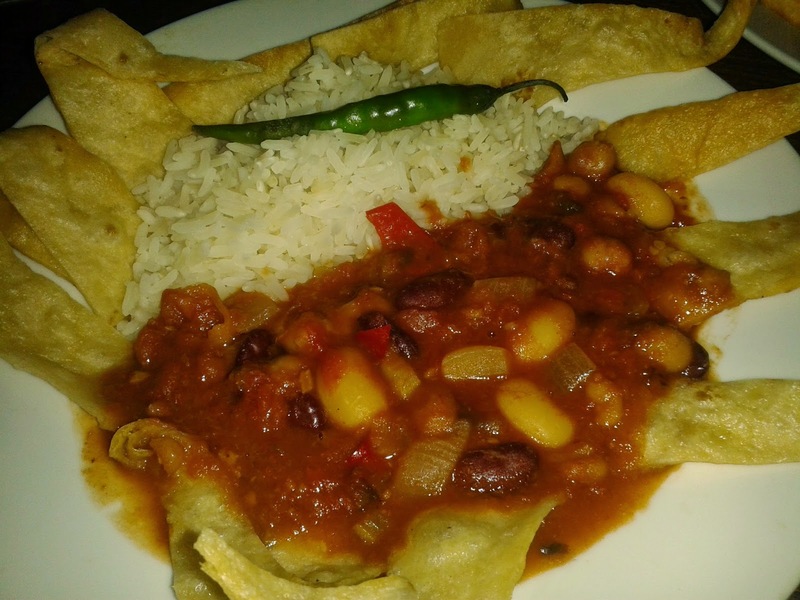 Jamie chose the mixed bean chilli and rice which he really enjoyed. For dessert I initially ordered the syrup sponge (after much deliberation!) 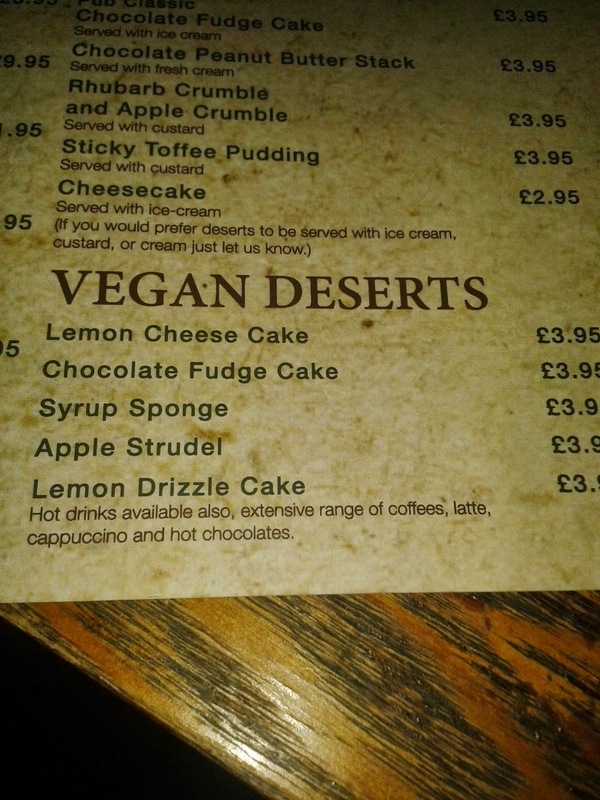 however the chef came out and informed me that he didn't have the ingredients to make vegan custard and said the sponge would be too dry without it so I went for the chocolate fudge cake. 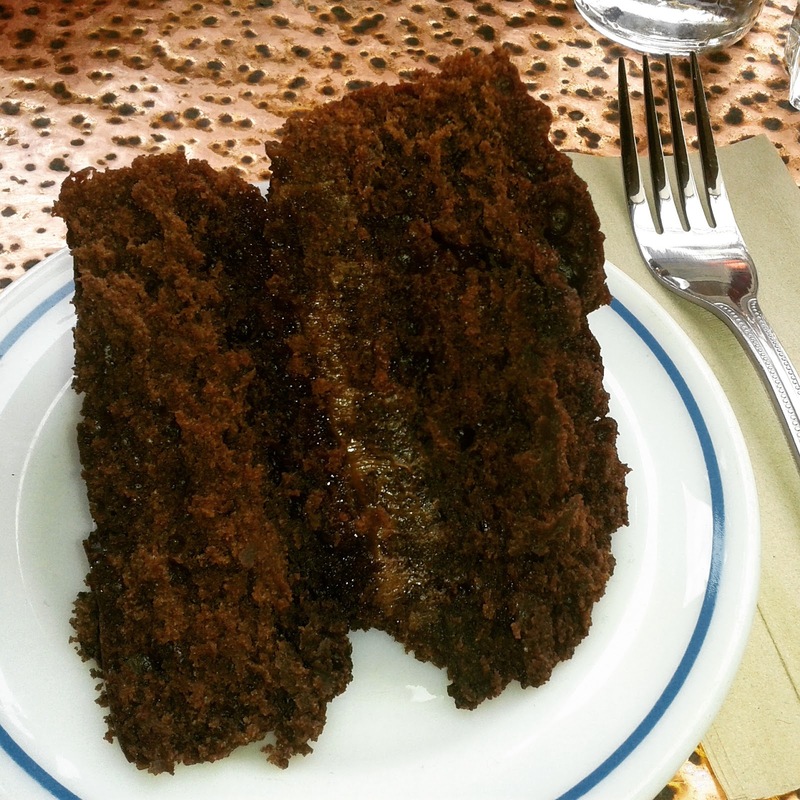 Never in my life have I seen such a huge slice of cake! 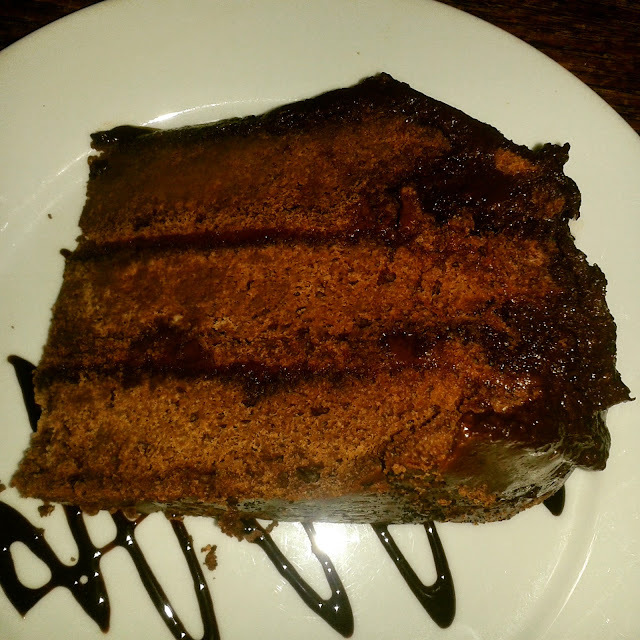 The cake was lovely, especially the gooey icing, but I couldn't finish it! We also went to a cafe called Cherry Reds which is situated not far from the Bullring shopping centre. Cherry Reds have plenty of vegan options and vegan cakes made by a local baker. I had a baked potato with houmous and falafel. It was delicious and I've since made it at home a few times; I love baked potatoes and it's nice to try them with different fillings. For dessert I couldn't decide between a cupcake or a slice of cake but I eventually decided to try the cake, which was chocolate sponge with berries in it. It was yummy! 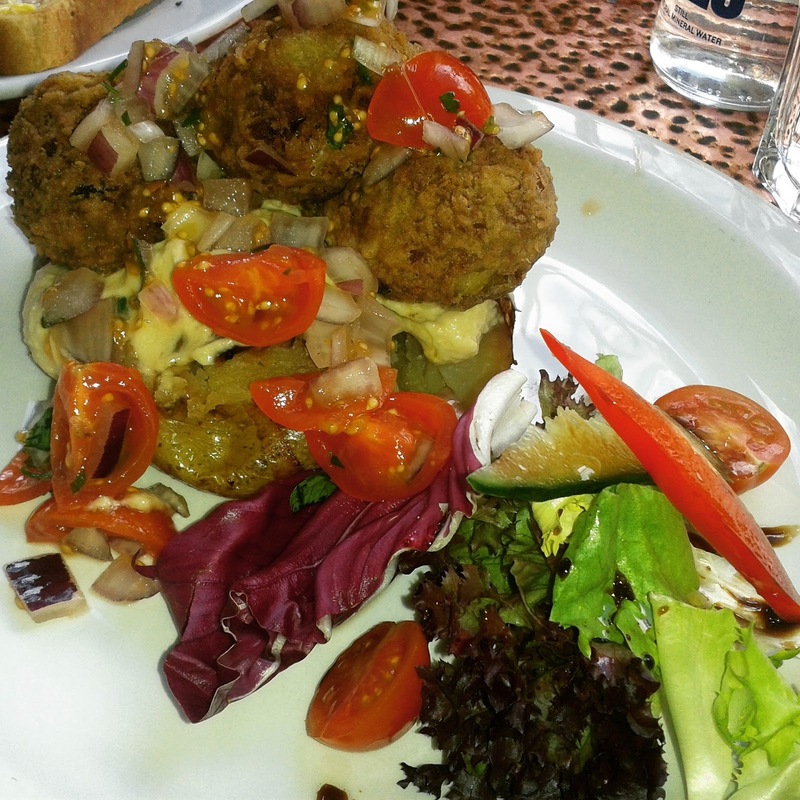 On a previous visit to Birmingham we went to another vegetarian restaurant called Bistro 1847 not long after it had just opened. I meant to write a review soon after we went but I never got round to it so I thought I'd include it in this post. 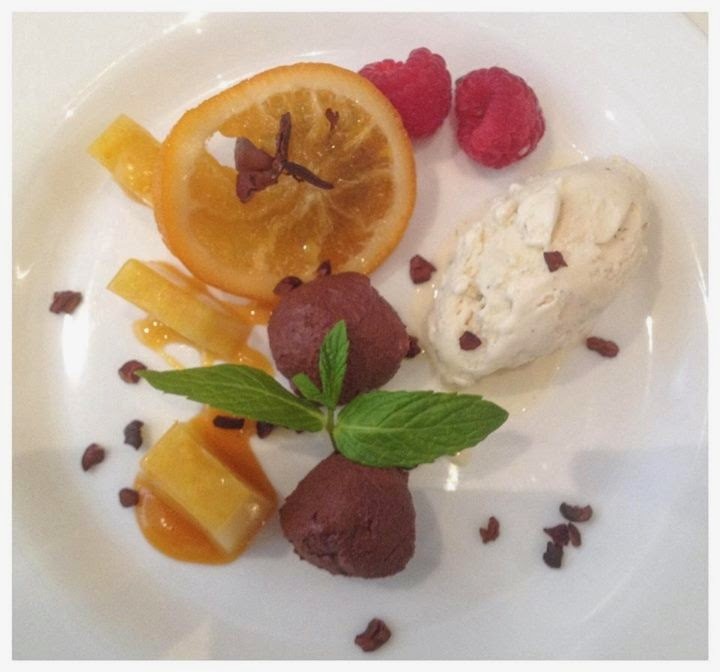 Bistro 1847 serves more sophisticated vegetarian and vegan food and is located in the Great Western arcade near the Snow Hill train station. 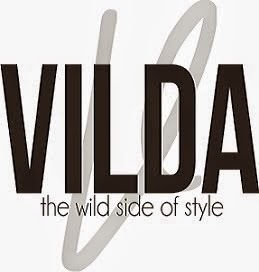 It is a lovely contemporary restaurant and the staff were really friendly and helpful. I also had tofu fish and chips here, but this time it was more of a posh version! It was equally as delicious though. For dessert I had dark chocolate truffles with cacao nibs & ice cream, which was really rich and decadent. 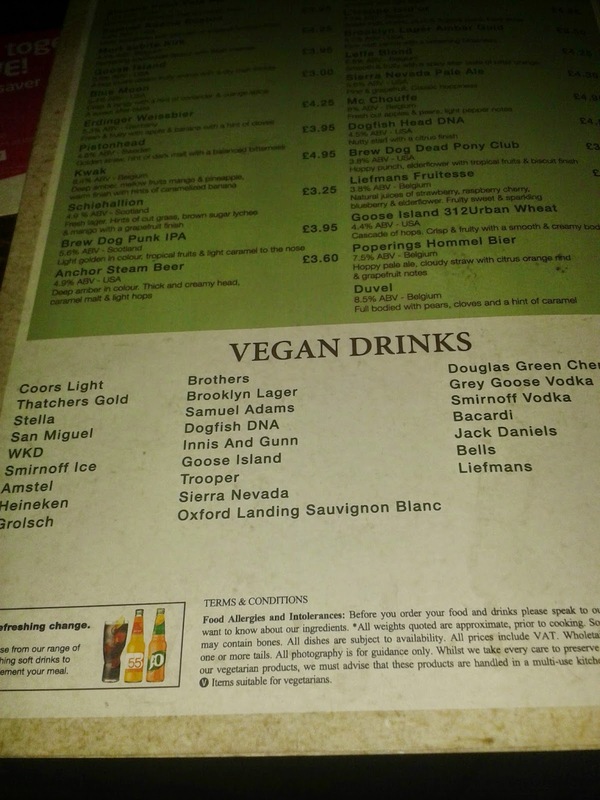 I'd love to hear about other great places to eat vegan in Birmingham so let me know if you have any recommendations! Vegan Life magazine is now monthly and it is almost time for the next issue to come out! May's issue was another fantastic one as usual. 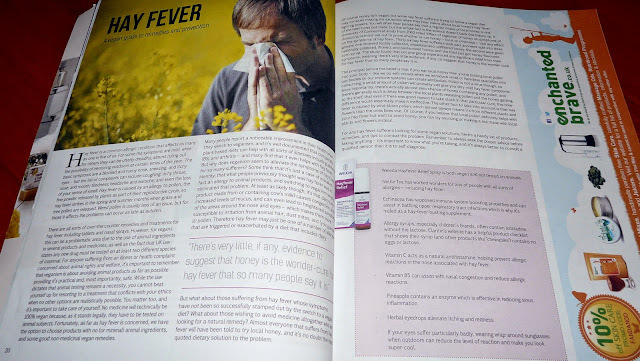 I found the article on vegan hay fever remedies really interesting as my boyfriend suffers with the condition and I am always looking for new treatments he could try. The article also debunks the claim that eating locally-produced honey can cure hay fever. There was a great piece on vegan sandwiches; I often struggle to think of exciting sandwich fillings but I now have plenty of ideas thanks to Vegan Life's suggestions. 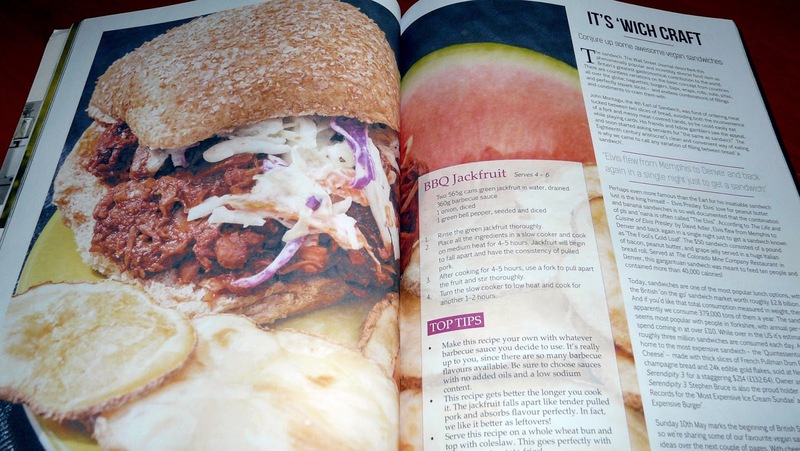 One I am particularly intrigued by is BBQ jackfruit. I keep hearing amazing things about jackfruit and how it is an excellent substitute for pulled pork. I have never eaten pulled pork so I have no idea what it's supposed to taste like, and I have no idea what jackfruit tastes like either, but it looks delicious! 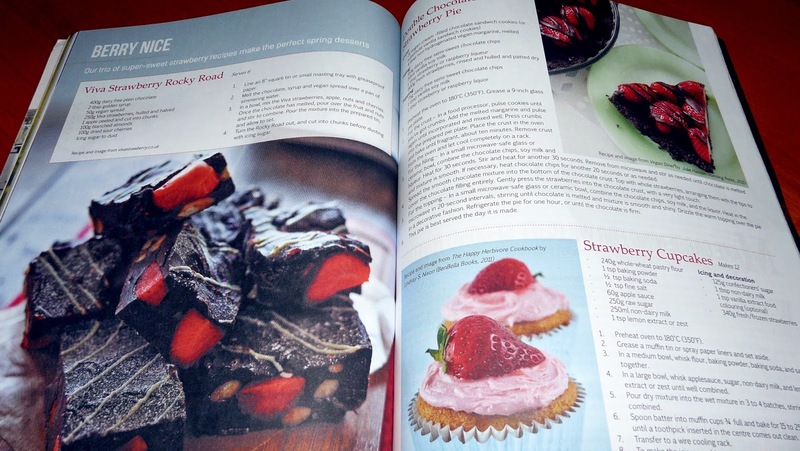 As usual there were some mouth-watering sweet recipes, and I can't wait to have a go at making strawberry rocky road, double chocolate strawberry pie, strawberry cupcakes (strawberries are now in season in Britain if you didn't know! 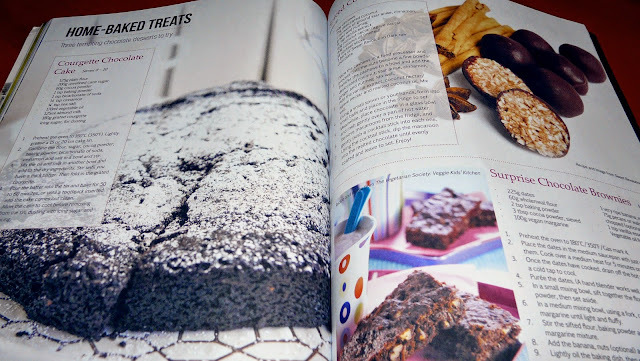 ), chocolate courgette cake, spiced coconut macaroons and surprise chocolate brownies. The debate in this month's issue was 'should vegans use animal manure?'. To be honest, this is something I have never even thought about. 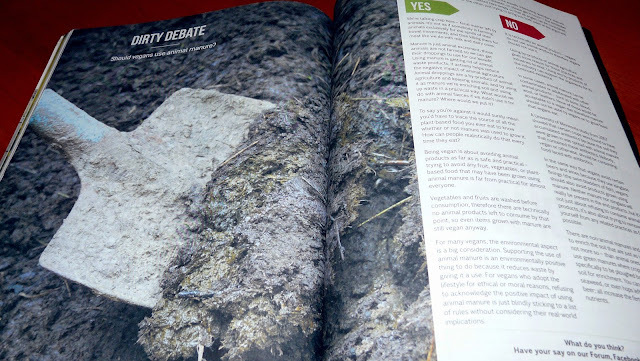 Arguments for included the fact that manure is just animal excrement, and to say you are against it would mean you would have to trace the source of all your food to see if manure was used to grow it or not. On the other hand, manure is technically an animal product and using by-products of animal agriculture supports the practices of the industry. Sometimes animal manure can be contaminated with bone, blood, wool, feathers and antibiotics. Although fruit and vegetables are washed before eating - removing the manure - sometimes traces of components of the manure such as antibiotics have been found to contaminate the crops. It is an interesting subject, and I guess the only way to avoid it is to grow as much of your own produce as possible using non-animal manures, or to buy local fruit and veg where you can find out how it was grown (luckily my sister has an allotment so I am able to get a lot of my veg from her). It does seem a little impractical to trace all sources of your food, so just remember that being vegan is about avoiding animal products as far as you possibly can. There were also two articles that explored a couple of common vegan myths. 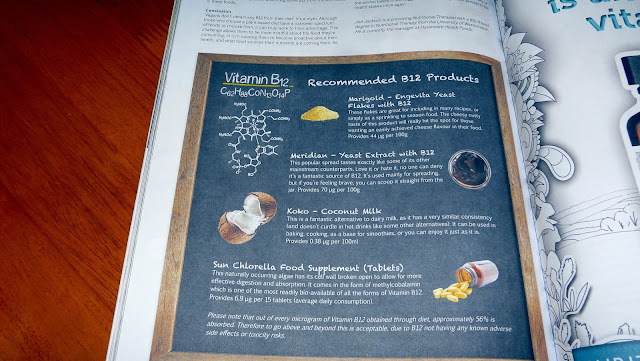 The vitamin B12 article outlined what the vitamin is, why we need it and recommended vegan foods that are fortified with it, showing that veganism doesn't automatically equal a B12 deficiency. The vegan pregnancy article demonstrated that you can get everything you need from a vegan diet to ensure that both you and your baby will be safe and healthy. 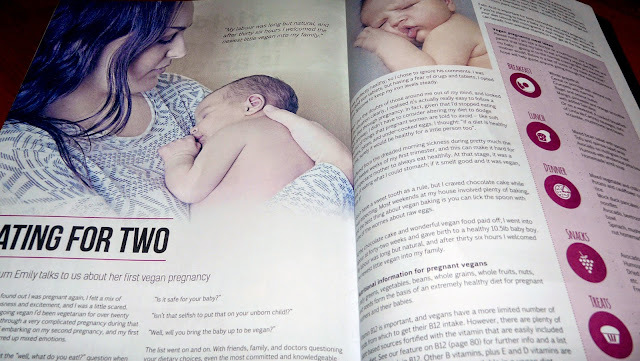 I often hear people say that they were vegan or veggie but stopped when they became pregnant. I think it's such a shame that some people unnecessarily give up their vegan lifestyle when they really don't need to. 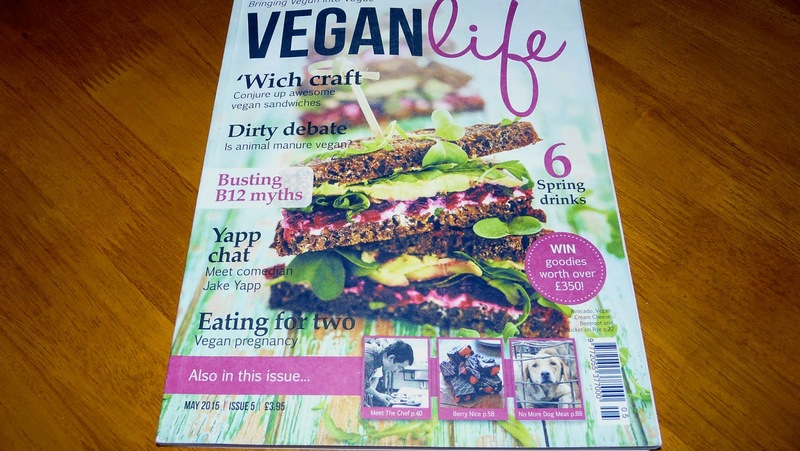 Issue 6 of Vegan Life magazine will be on sale very soon - you can subscribe to the paper version here and the digital version here. 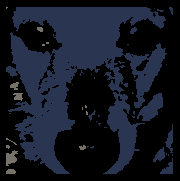 MyChelle Dermaceuticals are an American company that produce a range of highly effective natural skincare products and makeup. All of their products are vegetarian (and most are vegan, but honey, beeswax and yogurt are used in some products) and cruelty-free (certified by PETA), and are free from phthalates, parabens, sulfates, ureas, artificial fragrances and colours, petroleum, GMOs and gluten. MyChelle was the first natural beauty company to use bioactive anti-aging peptides, plant stem cells and clinically proven dermatologically active ingredients. I was kindly sent a bottle of MyChelle Advanced Argan Oil to try. 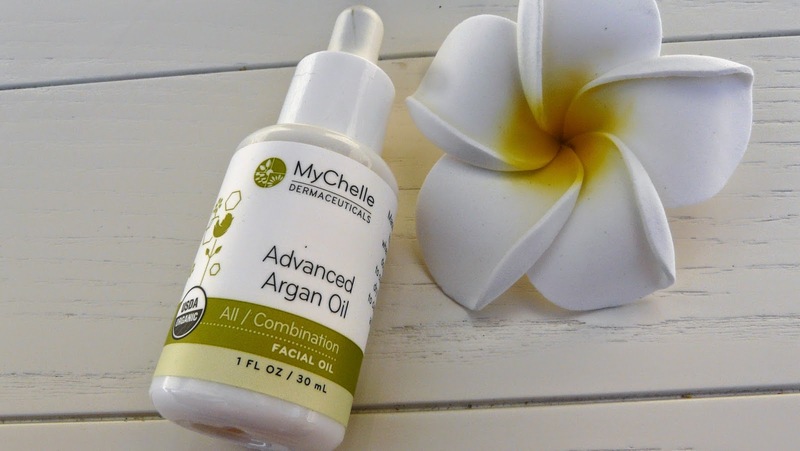 I love using oils to nourish my skin and I couldn't wait to try this one as I hadn't tried argan oil before. The product is actually a blend of organic argan and baobab oils and aims to protect, nourish and hydrate the skin, leaving it with a healthy glow. 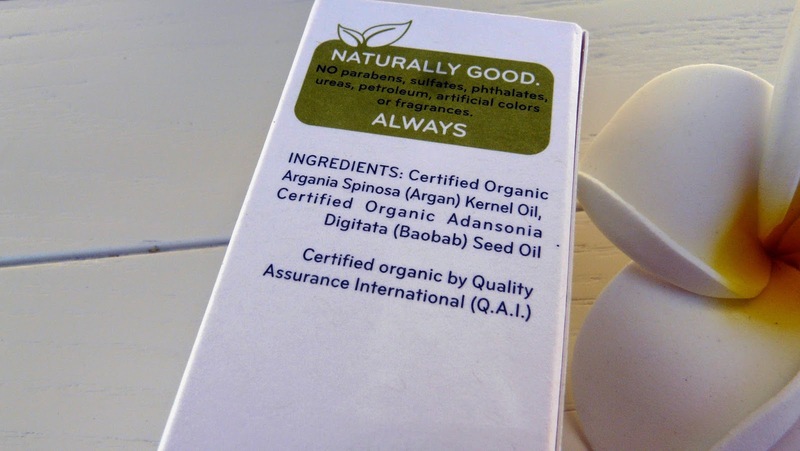 Argan oil is rich in poly-unsaturated fatty acids (including linoleic acid and omega-6) and vitamin E, and has nourishing, regenerating and protective properties. Baobab oil has softening, moisturising and soothing properties; it helps to protect the skin's natural barrier and also has a tightening effect. I have been using this oil at night and sometimes instead of a day cream under my foundation. 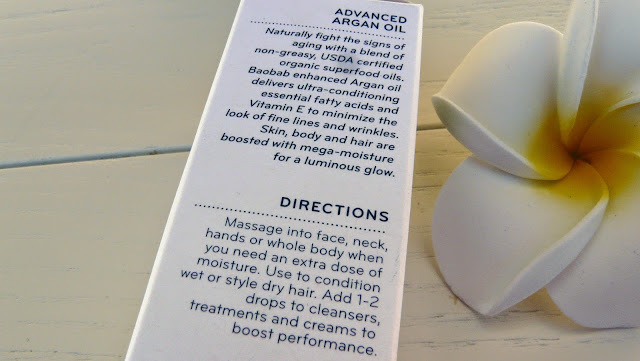 It is a really lightweight oil and it is easily absorbed into the skin. 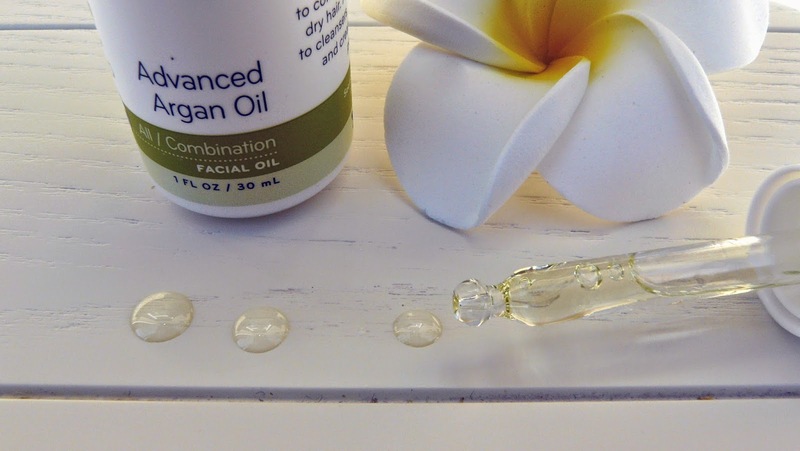 My skin is quite oily and blemish-prone at the moment so this oil has been perfect for helping to keep my skin hydrated without feeling too greasy. If I apply it at night my skin feels really soft and smooth in the morning. It is a great base for makeup too as it is not a heavy oil. I have also been using the oil on my hands as lately they have been really dry, cracked and sore from having to wash my hands a lot at work. When my hands have been chapped I have been massaging the oil into them at night and they feel a lot smoother in the morning. I love this oil and I would definitely recommend it to those who would like to benefit from using skin oils without them feeling greasy or heavy, particularly those with oily/combination skin types. 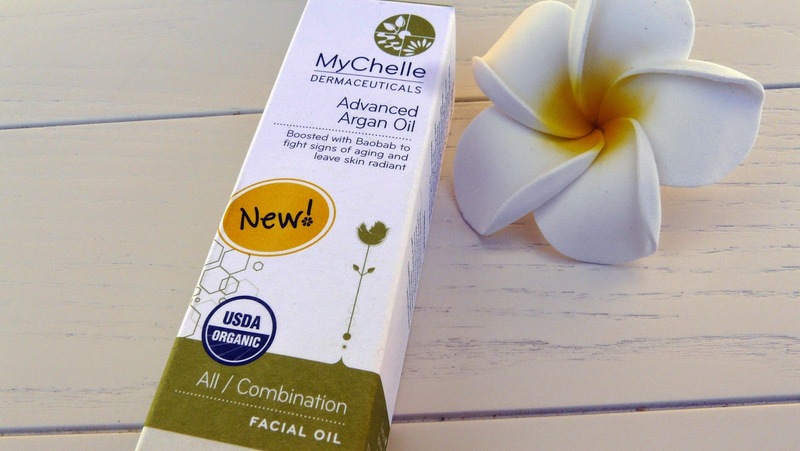 MyChelle Advanced Argan Oil retails at £16.95 and can be purchased in the UK from MyChelle's UK website as well as Look Fantastic, Beauty Bay and The Hut.